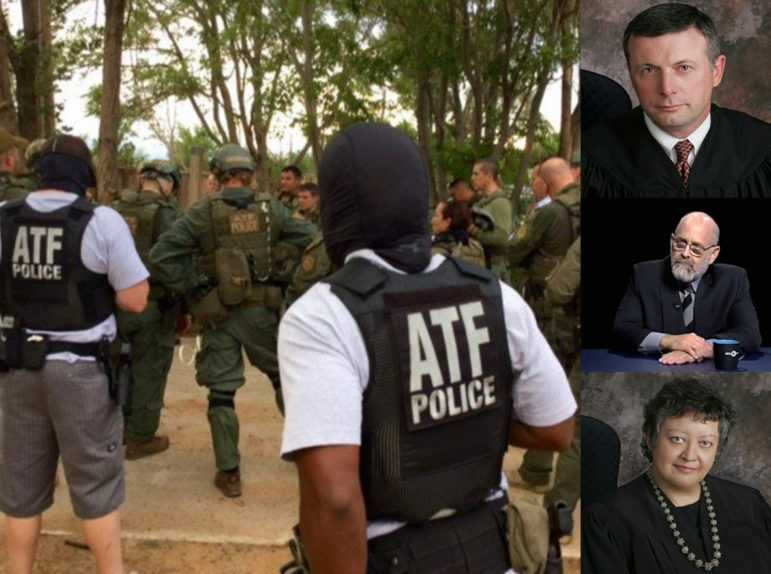 Clockwise, ATF agents who participated in the 2016 Albuquerque operation; U.S. District Judge William P. Johnson; Federal Public Defender Brian Pori; and former Chief U.S. District Judge Christina Armijo. A debate over how so many black people came to be arrested in a 2016 gun- and drug-sting operation in Albuquerque is playing out in the city’s federal courthouse. Following months of silence from the federal Bureau of Alcohol Tobacco Firearms and Explosives (ATF) and the U.S. Attorney’s Office, a narrative is beginning to emerge. It’s a story of good police work. According to this version, a pivotal moment happened a few days after the operation started in April 2016. Albuquerque Police Department detective Vic Hernandez handed ATF Special Agent Russell Johnson two sets of documents. Johnson had arrived in the city the previous month, but his unfamiliarity with Albuquerque hadn’t stopped the Mississippi-based agent from designing the sting. 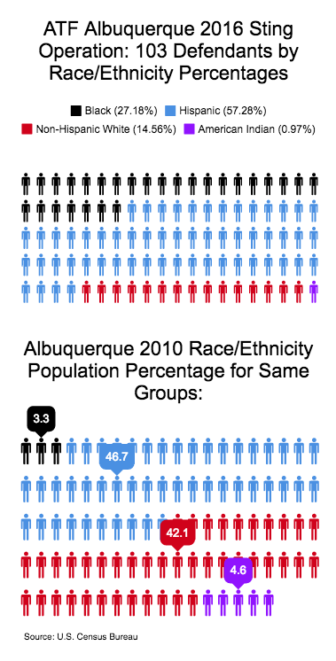 The operation employed five paid confidential informants — three black and two Hispanic — and would eventually nab 103 of what authorities called Albuquerque’s “worst of the worst,” including percentages of blacks and Hispanics disproportionate to the city’s population. The first document from Hernandez looked like a multi-page wanted poster with dozens of mugshots showing black men, their personal information and partial criminal histories. The phrase “Memphis Mob,” in bold, topped the document. It purported to show members of a “drug gang” that APD had named the “Memphis Mob” in 2009 in advance of several arrests and stories in the local news media. Questions continue to linger about how much of a gang it really is. The exchange of documents — and Hernandez tipping Johnson off to the existence of the Memphis Mob — eventually led to the arrest of 14 black men, a Hispanic man and a Hispanic woman during the 2016 operation, according to Johnson’s testimony. In all, 28 black people were arrested in the ATF operation. That’s 27 percent of the total number of people arrested, in a city with only a 3 percent black population — and in a state where black people made up just 5 percent of gun and drug defendants in federal court from 2006 through 2015. How the ATF came to target so many black people has been a persistent question. For more than a year, criminal defense attorneys have raised it in court motions. And NMID raised the question following its comprehensive analysis of the operation, including how it was designed, and a review of hundreds of federal court documents associated with those arrested. Prosecutors and Johnson say racial profiling didn’t lead to the racial breakdown of defendants, as defense lawyers have insisted, but good police work did. Criminal defense attorneys aren’t buying that narrative, however. They say the ATF’s operation fit the mold of the agency’s previous operations in other cities where it has been accused of racial profiling. And the “Memphis Mob” narrative, they say, is an after-the-fact story agents and prosecutors cooked up only after racial profiling allegations arose in late 2016. Assistant U.S. Attorney David Walsh swatted away the assessment from Robbenhaar, who represents ATF sting defendant Lonnie Jackson, and another defense attorney, Aric Elsenheimer, who represents Diamond Coleman. “I just think that’s very disingenuous and unfair, to accuse the government of coming up with the Memphis Mob notion to somehow prevail with respect to these motions that have been filed by the defense,” Walsh said in December. Over the past year, at least two federal judges have found enough evidence to not summarily reject racial profiling claims filed by defendants’ lawyers and have agreed that defense attorneys, over prosecutors’ protests, should receive additional evidence to test their theories. In a February ruling, then-Chief U.S. District Judge Christina Armijo specifically cited testimony from Johnson and another ATF agent on how informants were selected in the Albuquerque operation when ordering prosecutors to turn over records. Defense attorneys say those records will help determine if “discriminatory intent and discriminatory effect” were at work in the Albuquerque operation. Federal prosecutors and ATF agents have refused numerous interview requests over the past year, leaving NMID and the public largely in the dark about how the operation netted so many minorities and how the operation was designed. The “Memphis Mob” surfaced in multiple court hearings that NMID attended over several months. NMID’s review of the “Memphis Mob’s” origin story and evidence in cases, including audio recordings from arraignments or detention hearings for 16 black defendants snapped up in the ATF operation, has produced more questions than answers. News of the operation, its design and its results roiled black people in Albuquerque. Many who spoke with NMID last year said it harkened back to law enforcement tactics used against black communities in the 1960s and 1970s that are now roundly out of favor. Civil rights leaders in the city said the operation smacked of “failed War on Drugs” policies that led to an explosion in the nation’s prison population — disproportionately imprisoning black men. And ATF’s work in Albuquerque took place against a backdrop of longstanding national complaints from minority communities about the way their neighborhoods are policed. “Memphis Mob” first entered the public and law enforcement lexicons in April 2009, when the Albuquerque Journal published a front-page story about an APD-led operation. According to the newspaper, the investigation produced 35 arrests on gun and drug charges and was a potentially fatal blow to the gang. 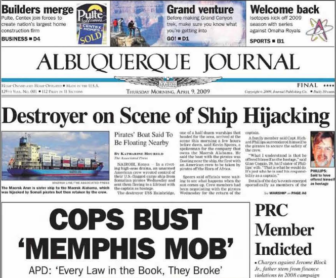 APD had invented the name of the gang, the newspaper reported, after police noticed a Memphis connection among suspects in numerous felony crimes, including some individuals who were allegedly shipping cocaine between Albuquerque and Tennessee. The 2009 list of alleged “Memphis Mob” members Hernandez, the APD detective, gave to Johnson at the start of the ATF operation in April 2016 is dated the day before the Journal published its story. Aside from a few stories about the convictions and sentencings for some purported “Memphis Mob” members, the so-called gang soon disappeared from public discourse. Lawyers representing defendants arrested in the ATF operation question whether the gang even exists — or whether it was created from whole cloth by APD and later seized upon by the ATF. Through his attorney, Cedric Laneham, one of the 2016 ATF defendants accused of gang membership, denied ever hearing the name “Memphis Mob” until it showed up in one of agent Johnson’s reports. Laneham admitted past membership in the Gangster Disciples in Chicago. Two former APD detectives who worked on the investigation from 2007 through 2009, meanwhile, said department higher-ups inflated the “Memphis Mob’s” significance in 2009. The former detectives spoke to NMID in return for not being named because they still have dealings with APD. The other said he arrested one of the men on suspicion of a $200 cocaine sale, but was never told the man was a gang member until he saw the Journal article. The selling of small amounts of drugs would fit the profile of many of those swept up in the 2016 ATF operation. The vast majority of the ATF cases involved drug buys for less than $5,000, a NMID review found last year. Such small amounts are highly unusual for federal cases, seasoned defense lawyers say. Normally, amounts range from about $15,000 into the millions of dollars, they say. Johnson testified in court last year the only additional materials he reviewed when he was researching the gang were the Journal story and a KOAT-TV article about the 2009 takedown. Johnson agreed with the plain language used in the story. 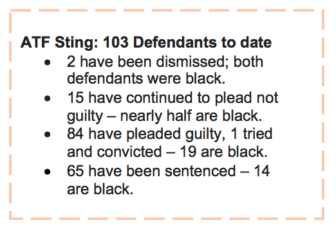 Sixteen of the 28 black defendants arrested in the 2016 operation appeared in federal court for arraignments or detention hearings. There was not one mention of the “Memphis Mob” in those hearings by prosecutors or Johnson, an NMID review found. Johnson appeared to be in attendance at several of the hearings that were conducted soon after the defendants’ arrests over a couple months. Robbenhaar and Elsenheimer have sought to admit the recordings as evidence in their clients’ cases. Prosecutors say they are irrelevant. “For lack of better phrasing, judge, and this is not meant to be offensive, but Memphis Mob, Memphis Boys, it’s kind of like what we hear in politics, dog-whistle politics,” Assistant Federal Public Defender John Robbenhaar said. In a December court hearing, Robbenhaar asked why agents and prosecutors wouldn’t have mentioned gang affiliations, given that dangerousness is among the factors a federal magistrate must consider at a detention hearing in determining whether to release a person. For his part, Johnson testified in the same court hearing that he did not recall whether “Memphis Mob” came up at the detention or arraignment hearings he attended. There appears to have been no mention of the “Memphis Mob” or the takedown of several of its members at an August 2016 news conference announcing the operation’s results, which was attended by several law enforcement officials, including then-U.S. Attorney Damon Martinez. Nor was there a mention in an email Johnson penned to colleagues days before that news conference directing them to a list of 24 “righteous targets” who had been ensnared by the sting. As cases from the ATF operation have continued to move through the courts, there have been no mentions of the “Memphis Mob” in scores of news releases from the U.S. Attorney’s Office, either, even though several cases involve individuals Johnson named as “Memphis Mob” members in court in December. Robbenhaar and Elsenheimer have pointed to another data point in their theory that the “Memphis Mob” connection is an after-the-fact justification. In mid-December 2016 — more than four months after the operation concluded — Johnson amended one of the reports in the Cedric Laneham case to include a paragraph about Laneham’s alleged links to the Memphis Mob, a connection that does not appear in earlier versions of the report. Johnson also attached the Journal article to the report. “The date is key. December of 2016 is about the commencement, about the time the selective enforcement litigation started,” Robbehnaar told Judge Armijo in December, using legal nomenclature for what is known in everyday language as racial profiling. “I just think that’s very disingenuous and unfair, to accuse the government of coming up with the Memphis Mob notion to somehow prevail with respect to these motions that have been filed by the defense,” Assistant U.S. Attorney David Walsh said in December. Walsh, the prosecutor, denied that Johnson’s amending of the report in Laneham’s case was an attempt to create a post-operation justification for the number of blacks snapped up. He told the judge the U.S. Attorney’s Office had requested additional information from Johnson because prosecutors needed more evidence in the Laneham case. It is now up to federal judges to determine whose narrative — the prosecutors or criminal defense attorneys — wins out. But it won’t be Armijo, a President George W. Bush appointee who was the chief federal judge for New Mexico until February 2018, when she assumed senior judge status. U.S. District Judge William P. “Chip” Johnson, another George W. Bush appointee, is now presiding over the cases against ATF defendants Jackson and Coleman. At a hearing earlier this month, Johnson signaled that he was more skeptical of the racial profiling claims than Armijo was. Correction: The story originally said Assistant Federal Public Defender John Robbenhaar represents ATF sting defendant Diamond Coleman and another defense attorney, Aric Elsenheimer, represents Lonnie Jackson. In fact, Robbenhaar represents Jackson while Elsenheimer represents Coleman. The story has been updated to reflect this correction.